Traveling around New York City you meet a lot of wonderful people, but it’s also inevitable that you’ll run into some dangerously disturbed people that need help. I ran into one such character the other day while waiting on the platform for my train. While Aikido has many spiritual, mental, and fitness benefits, it’s still a martial art, and this encounter would test my preparedness. New Yorkers tend to not look directly at the source of a loud disturbance when it happens, because they happen all the time and you don’t want to encourage the behavior. But when this man started screaming people turned their heads. I’m not sure what set him off, but he seemed upset that a stranger had bumped into him or perhaps someone he knew said something to set him off and walked away. Either way, he starts screaming profanities, swinging his arms violently in the air, and directly addressing people on the platform with their heads down trying to ignore him. He’s doing this all directly behind me and I instantly size him up. My gaze is staring down the tracks with one earbud in as if I’m anxiously awaiting the train to arrive, but all my focus is staring at this man. At roughly six foot seven inches tall, he’s a lengthy, lanky man. He’s literally practicing punches behind me so I get a sense for his fighting style and reach with a punch. He’s only throwing hooks and that shortens his reach by almost a full foot by the way he’s pulling them. He’s also clearly fast as he shows off his footwork moving around the platform as if in the middle of a boxing match. Of course I’m doing everything to avoid a fight in this scenario. I’ve never had to use my physical training in a real-life, self-defense scenario and I’d prefer to keep it that way. But I’m also prepared and thinking through the possible scenarios. I as nage throw uke in a Katate kosatori Kokyunage. My Karate training of 10 years tells me I’d need to get in close to erase his height advantage, my target area likely would not be his face because I’d overextend myself reaching that high, and, beside, he has a large exposed torso ripe for damage — if he were to come my way. With all of those thoughts flashing through my mind, the man plants himself directly behind me and continues to scream. All of a sudden, he switches to a calm, mild mannered tone, simultaneously asking for money and attempting to sell me drugs, but I don’t acknowledge him. My policy has been to not engage with threatening people like him unless they break that wall and call me out for ignoring them. At that point if you don’t engage calmly, the matter is made worst. But thankfully, it doesn’t get to that point as the train pulls up, he walks away, and everyone gets on the train safely. Clearly the awareness and physicality of my Karate training had kicked in because that’s the basis of my training, but as my adrenaline subsided and I reviewed the brief 30 second scenario I just experienced, I realized that my Aikido training sneaked its way into my brain as well even if it wasn’t as obvious to me at the moment. Aikido has given me a better sense of my surroundings, especially given some of the space constraints we have to work with at my dojo. 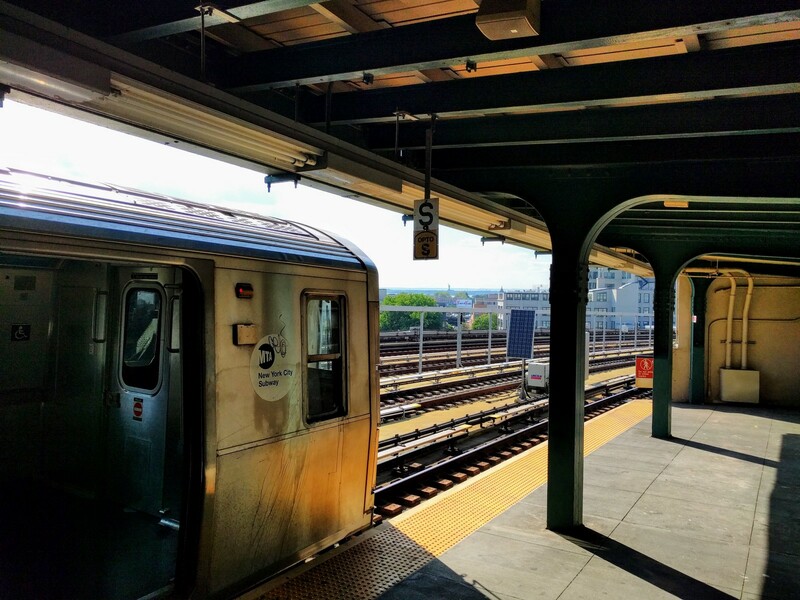 When the man approached me I knew I would have to push him straight back and to my right if the situation became physical because I had the tracks directly in front of me and a large group of people on either side of me on the platform. It was also a situation in which there wasn’t much room to run. I wouldn’t want to throw and dash, especially since I was concerned for the other people on the platform, which means I’d need to perform an arm or wrist lock of some sort once he was taken down. In my karate training we rarely went over ground locks after a throw, just scoring points. So while I’m comfortable with the proper way to strike someone on the ground, actually restraining an opponent until, for example, the cops arrive, is something I’m less comfortable with. Aikido has allowed me to practice and think about space and ground locks in a more structured way, and I hope as I progress it will become far more natural than it is now after just a short few months of training. My Aikido and Karate training rarely ever culminates in these potential self defense scenarios, but when it does it’s comforting to look back and think that I was relatively prepared in case something happened. In many ways Aikido is more of a spiritual and subtly challenging martial art, but this scenario clearly showed me how Aikido can be used in the real world as well. 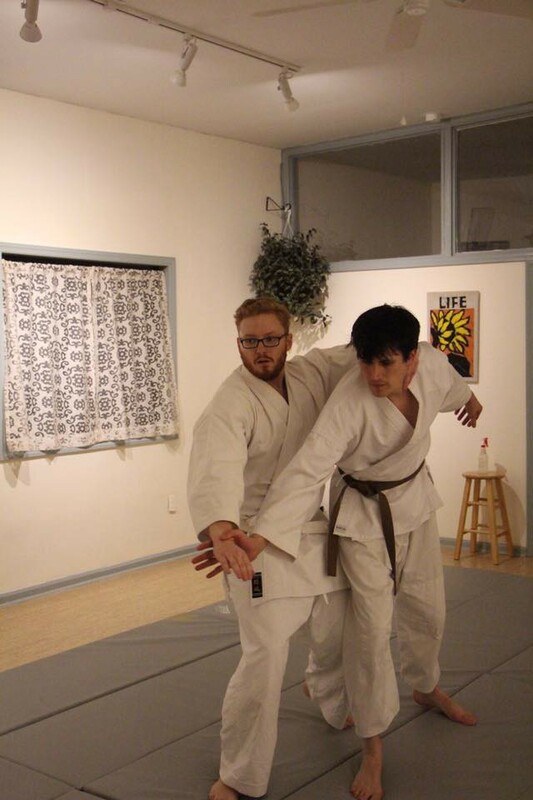 Reflections on the benefits and impact of Aikido training.